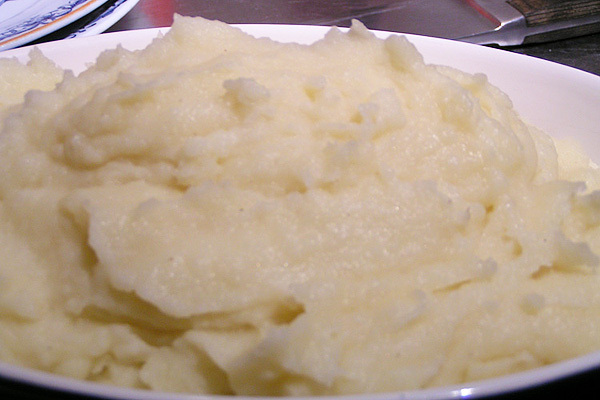 You don’t really need a recipe for mashed potatoes but this recipe is about proportions of butter and milk to potato. You can of course add as much butter as you like. You don't really need a recipe for mashed potatoes but this recipe is about proportions of butter and milk to potato. You can of course add as much butter as you like. 150 gr butter salted butter is fine. Peel and cut up the potatoes into equal size pieces so that they all cook at the same time. Place potatoes in a pot and add just enough water to cover and 1tsk or 1teas of salt. Bring to a boil and cook for approx. 20 minutes. In the mean time in a small pot heat the milk and butter together. When cooked, drain and pass the potatoes through a potato ricer or a Mouli. Add the milk, salt, white pepper and nutmeg, stir everything together. Taste for salt. Serve hot with a little soft butter on the side. I put this recipe up, not because anyone really needs a recipe for mashed potatoes but its good to have an idea about proportions. 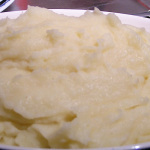 I never use an electric mixer to mash potatoes, it makes them sticky and starchy which makes horrible mash. Ricing them or passing them through a Mouli (a food mill) produces a much smoother mash. Buying a ricer is cheap and is so worth the small investment and makes light work of mashing things. Without a ricer use an old fashion potato masher. When you mix in the the milk and seasoning, only mix it enough to blend all the ingredients to avoid them getting starchy. Feel free to mix the liquids, such as half milk and half cream or add a bit more butter. This is only a guide concerning proportions. My grandmother used to through a clove of garlic whole unpeeled into the boiling water along with a bay leaf. Yes she was Italian. Most important is to use the right potatoes, use mashing potatoes. The bags are usually marked with information about what that particular potato should be used for.